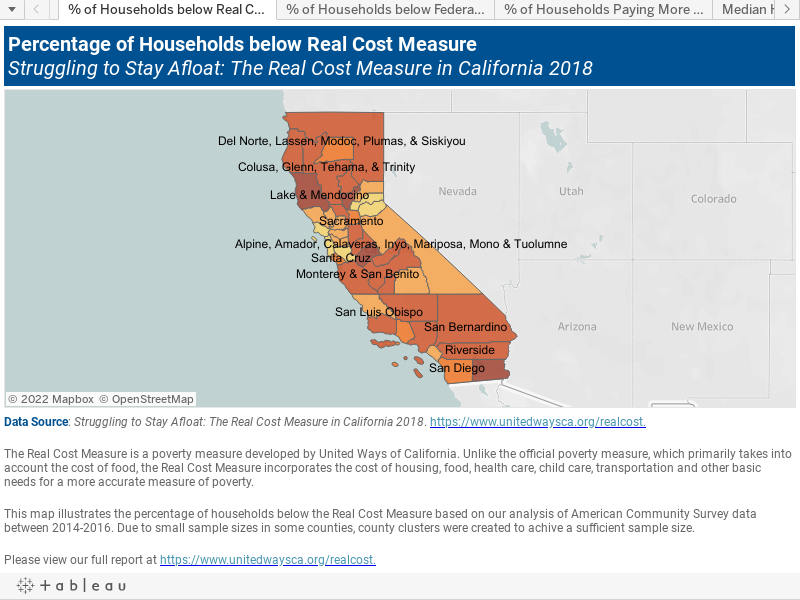 To help visualize what the Real Cost Measure looks like throughout California, feel free to explore the maps below by counties and county clusters. Simply hover your mouse over any neighborhood cluster to view interactive data. Note there are four maps illustrated below. The first map illustrates the percentage of households below the Real Cost Measure, the second map illustrates the percentage of households below the official poverty measure, the third map illustrates the percentage of households paying more than 30% of their income on housing, and the last map illustrates median household income. As you hover over the map, notice that a toolbar appears on the upper-left hand corner. Feel free to use that toolbar to zoom in and zoom out. To reset the map, press the "Home" button on the toolbar. Click here if you would like to see this visual on Tableau Public.